The nanocrystalline zinc ferrite (ZnFe2O4) was obtained by high-energy ball milling in planetary mill from a mix- ture of Fe3O4 and Zn. The formation of zinc ferrite was controlled by X-ray diffraction and magnetic measurements. 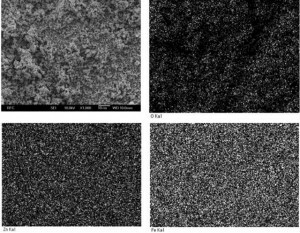 The chemical homogeneity and morphology of powders were studied by X-ray microanalysis and scanning electron microscopy. 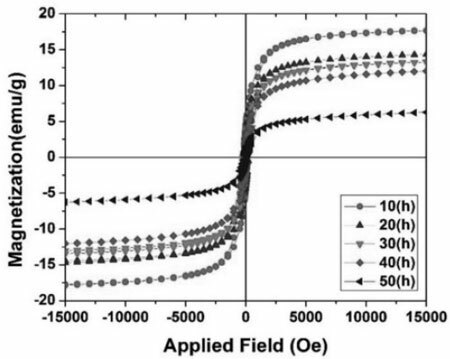 The evolution of the magnetization versus milling time was discussed and evaluated in terms of milling induced cations reorganization in spinel structure. Ferit kẽm ( ZnFe2O4) dạng nano tinh thể thu được khi nghiền năng lượng cao hỗn hợp bột Fe3O4 và Zn trong máy nghiền hành tinh. Sự hình thành của ferit kẽm được nghiên cứu bởi nhiễu xạ Rơnghen và các phép đo từ tính. Tính đồng nhất hóa học và hình thái của các loại bột đã được nghiên cứu bằng vi phân tích X-ray và kính hiển vi điện tử quét. Tiến trình từ hóa theo thời gian nghiền được thảo luận và đánh giá bởi sự sắp xếp lại các cation trong cấu trúc spinen do quá trình nghiền gây ra. Soft magnetic ferrites with spinel structure are materials with a large variety of applications in electronic and telecommunication industries . These ferrites have a structural formula of MFe2O4, where M is divalent metal ion from 3d transition elements such as Mn, Cu, Ni, Co, Zn or their combinations. Among spinel ferrites, zinc fer- rite has long been the subject of study because of its unique properties such as chemical and ther- mal stability and the particle size dependent mag- netic properties. ZnFe2O4 is characterized by a normal spinel structure in which Zn2+ cations with no magnetic moment occupy tetrahedral sites, while all the Fe3+ cations are in octahedral sites of close packed cubic lattice. No exchange interac- tion of each lattice site of ZnFe2O4 configuration takes place. The zinc ferrite is paramagnetic at room temperature. ZnFe2O4 is of particular inter- est in changes of magnetic behavior for nanoscale particles prepared by milling treatments or other means . 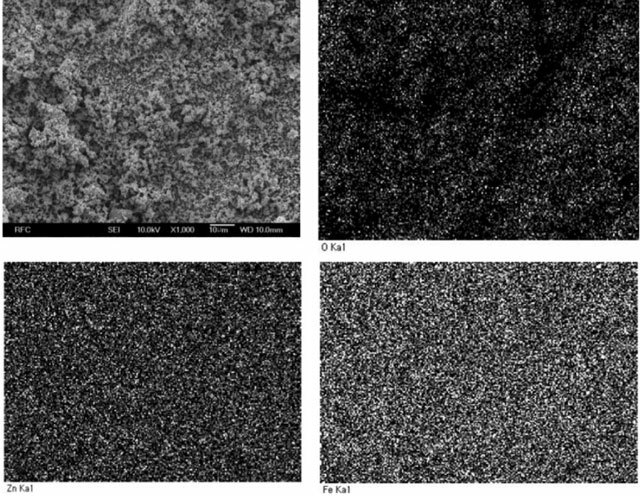 Several methods have been used to synthesize zinc ferrite nanoparticles such as ball milling, sol-gel, co-precipitation, hydrothermal technique auto-combustion route, ultrasonic cavi- tation, etc. Among above techniques, high-energy ball-milling or mechanochemical activation is the technique most used to prepare nanocrystalline powders of various materials due to its simplicity, low cost and good reproduction [3,4]. This paper presents the synthesis of nanocrys- talline zinc ferrite by high-energy ball milling and the characterization of some structural, morpho- logical and magnetic properties. Magnetite and zinc powders were processed in a planetary ball mill with harden steel ball and jar. Raw materials were commercial Fe3O4 (98% pure) and Zn (99% pure) powders. The composi- tion of starting mixture was stoichiometric. The material/balls ratio was 1/10. Milling time was set to 10, 20, 30 and 50 h. The phase composition of samples was analyzed by X-ray diffractometer (XRD) with CuKu radiation. XRD patterns were recorded in range of 28 = 25+70 degree. Microstructure analysis was carried out using scanning electron microscope (SEM) and energy dispersive X-ray spectroscopy. Magnetic proper- ties of milled powders were measured at room temperature in field up 15 kOe using a Vibrating Sample Magnetometer (VSM). Fig. 1 shows X-ray diffraction patterns of start- ing powder mixture (Fe3O4 and Zn). The main dif- fraction peaks are belong to Fe3O4 and Zn phas- es. After milling for 50 h, the Bragg peaks of mag- netic and zinc phases disappeared and full zinc ferrite phase was obtained. During milling process, ZnO and Fe2O3 intermediate phases may appear after 2+10 h of milling fig. 1(b). It can be also noticed a small contamination of powders with iron from vial and balls. The powders contamination with elements from milling bodies is difficult to avoid completely and frequently encountered. An element mapping image showing the spatial distribution of Zn, Fe and oxygen in a sample milled for 50 h can be seen in fig. 2. These ele- ments distribute rather uniform in the sample vol- ume. Particle sizes of milled powders are ranged in submicrometer scale. Fig. 3 shows the VSM measurements for mix- tured powders after different milling time at applied field ranged from -15 to 15 kOe. 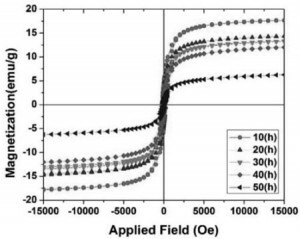 All the magneti- zation curves have hysteresis loops and saturation magnetization corresponding to ferromagnetic behavior . 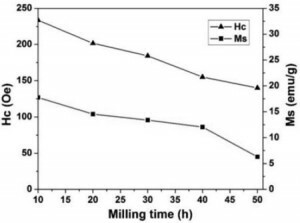 A continuous decrease of the saturation mag- netization and coercivity with increasing milling time from 10 to 50 h, reflects a structure change of the milled powders. The powders tend to become superparamagnetic materials. Which has no loop, coercivity (Hc) and remanence. For 50 h milled, powders the saturation magnetization value is 6.3 (emu/g) and Mr is 0.95 (tab. 1). The zinc ferrite phase obtained by ball milling pos- sesses a configuration change of cations sites in spinel structure leading to change of magnetic properties. In a normal spinel structure Fe3+ cations are ordered in octahedral sites and cations Zn2+ in tetrahedral ones. But due to milling there is a partial redistribution of Fe3+ and Zn2+ cations between octahedral and tetrahedral sites in the spinel structure. Consequently these cations have non-equilibrium distribution and a change in magnetic properties occurs. The drop of Ms from sample milling at 10 h to 50 h (fig.4 and tab. 1) is due to accumulated structural damage of magnetite (which is the only magnetic phase in the system), as it was observed by XRD (Fig. 1). For prolonged milling time to 50 h, a superparamagnetic behavior can be seen for as-milled ZnFe2O4 powders. It is explained that the cations inversion and in addition, a spin canted effect and ionic disorder were attributed to the effect of milling . 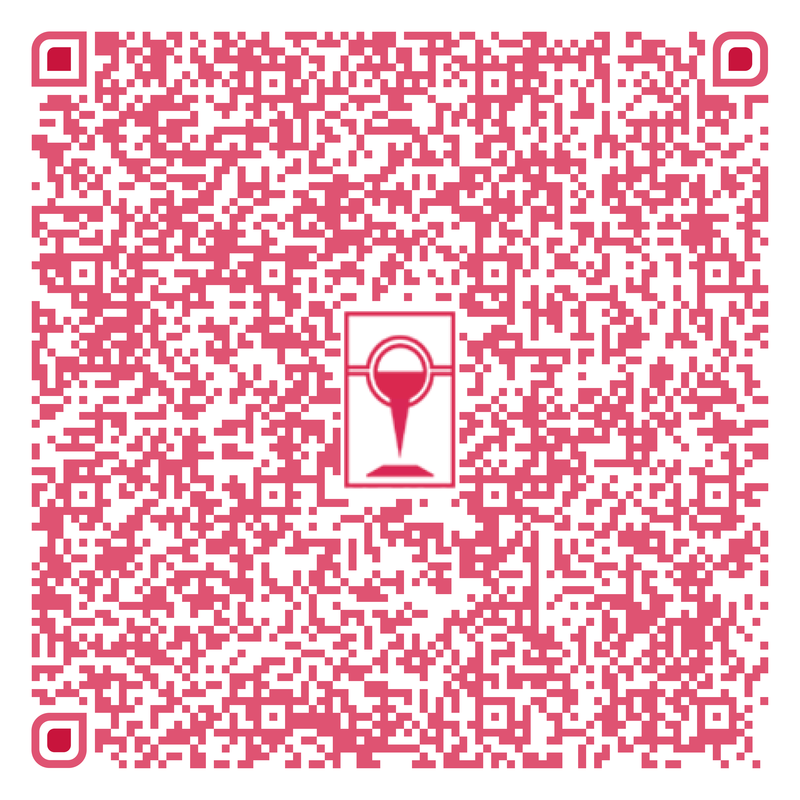 The satura- tion magnetization value of sample milled for 50 h is about 6.3 (emu/g). By comparison to values obtained by other research groups for nanocrys- talline ZnFe2O4, there is a broad range of the reported values for Ms (12 ÷ 88 emu/g) showing that Ms value may strongly depend on various factors including the synthesis route and its con- ditions, type of the precursors, subsequent annealing treatments, etc . The evolution of coercivity, Hc, with activation time represented in fig. 4. Hc values increase with prolonging milling time due to the damage of Fe3O4 phase and the formation of ZnFe2O4 phase. Fig.4. Saturation magnetization, Ms and coercivity, Hc, as a func- tion of activation time. Nanocrystalline zinc ferrite was obtained as single phase after 50 hours of milling from a sto- ichiometric mixture of the commercial magnetite and zinc. The magnetization studies suggest an inversion of the Fe3+ and Zn2+ cations between the tetrahedral and octahedral sites in the spinel structure. The magnetization was saturated under a magnetic field of 15 T. This behaviour could be explained by a superparamagnetic component that can be given by very small par- ticles and by a spin canted effect. Ball milling method is suitable to obtain nanocrystalline zinc ferrite with good magnetic properties. Further investigations in order to clarify the cations dis- tribution are in progress. P. M. Botta, P. G. Bercoff, E. F. Aglietti, H. R. Bertorello, J. M. Porto Lopez; Synthesis and magnetic proper- ties of zinc ferrite from mechanochemical and thermal treatments of Zn/Fe3O4 mixtures; Materials and Engineering A360, (2003), pp. 146-152. H. Ehrhardt, S. J. Campbell, M. Hofmann; Structural evolution of ball-milled ZnFe2O4; Journal of Alloys and Compounds 339, (2002), pp. 255–260.